The curry of Mexico, indeed: this unexpected dish was served in the cowboy grub line and we were pleasantly surprised. 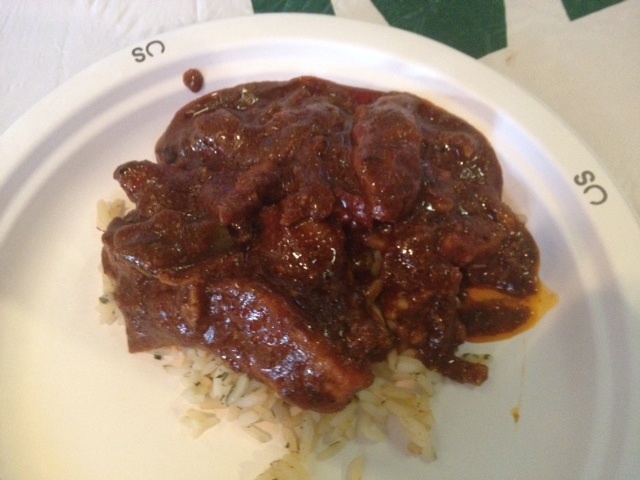 Chicken thighs with onion, tomato and bell peppers were smothered in the richest mole poblano. The sweet and smokey sauce packed a wallop: spicy, deeply dark, and lovely. And so at home amidst the usual barbecue. Makes enough for smothering one chicken or a pork shoulder, previously cooked. Remove the seeds and stems from the chiles and soak them in very hot water until soft, about 30 minutes or so. When softened, puree the chiles in a blender. In a small skillet, sauté onion in vegetable oil until soft and translucent. Add garlic and sauté another minute. Add spices and herbs and cook, stirring constantly, for about 30 seconds, being careful not to let them burn. Add to the chile puree in the blender, the almonds, the cooked onions and garlic, tomatoes, raisins or prunes, sesame seeds, salt, pepper, water, and melted chocolate, then puree until smooth. Build in an ice-filled Collins glass and garnish with a mint leaf. Need a dessert idea for your upcoming Stampede party or potluck invite? We can think of four booze-fuelled treats. There’s luscious, tequilla-filled margarita pie. Kaluha Mud Pie, whiskey-soaked fudge, and this baby, merlot and cranberry brownies. 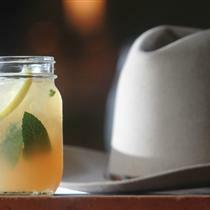 It uses the Stampede’s firewater, being sold at liquor stores as we speak. Can’t wait to try it. Preheat oven to 350F. Grease a 10×12 baking pan. In a large sauce pan melt the dark chocolate, butter and salt (keep warm). In a small sauce pan add the cranberries and wine together, bring to a boil, turn off heat and let sit. Slowly add the egg mixture to the warm butter and chocolate. Fold in flour and cranberries. Bake for 18-20 minutes, serve warm. 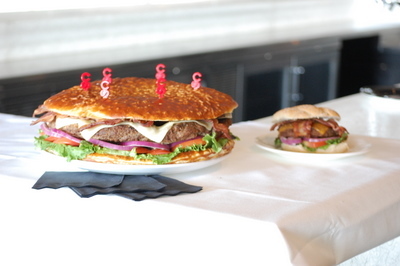 The Outlaw burger is Maverick’s monster burger: four pounds of juicy AAA Alberta beef with eight slices of Canadian horseradish cheddar cheese melted on top plus 12 strips of double-smoked bacon, six whole Roma tomatoes and a half a head of butter leaf lettuce staked in between a custom made 12-inch pretzel bun brushed with an ancho-mustard aioli. Always on the lookout for Stampede recipes over here. 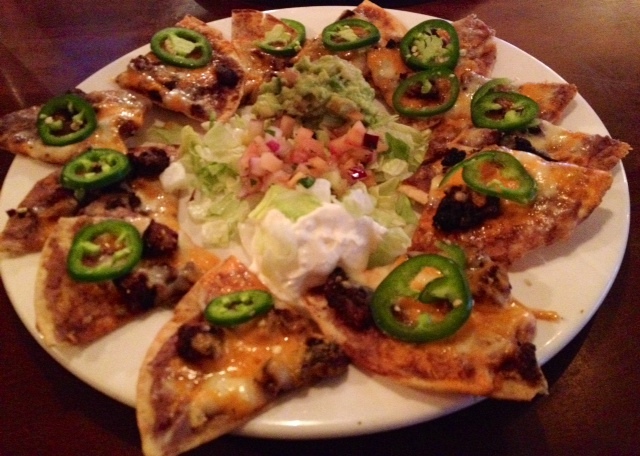 Here’s a quick barbecued nacho idea for a group, perfect with cold beer. Or bacon Caesars! 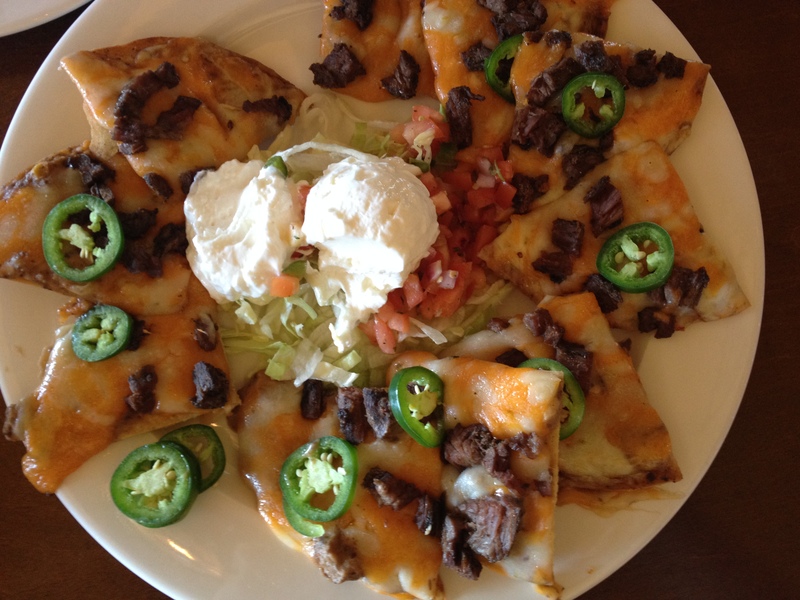 It’s a riff on retro Nachos Grande from Chi Chi’s. Each chip is covered with a thin smear of refried beans, cheese and a slice of jalepeno. Tidbits of sliced grilled steak or chicken can be added over top. Or seasoned ground beef can join the bean layer, but remember: it has to be thin! In a large pan, brown ground sirloin and diced onion. Drain fat, and toss mixture with just a touch of smokey habernero barbecue sauce or your own mix of chili powder, cumin and oregano. Then, start layering on fresh corn tortillas. For every three tortillas, plan to use about a 1/4 of a can of refried beans: cover but don’t smother. You want to be painting the tortilla rather than spreading a thick layer of mortar! You can layer a spoonful of bbq beef or grilled beef or chicken tidbits now or after sprinkling grated marbled cheddar cheese over top. Top each quarter with a pickled or fresh jalepeno. You can also add them after so folks can avoid them if they wish. Heat barbecue grill (we use mini pizza stones). 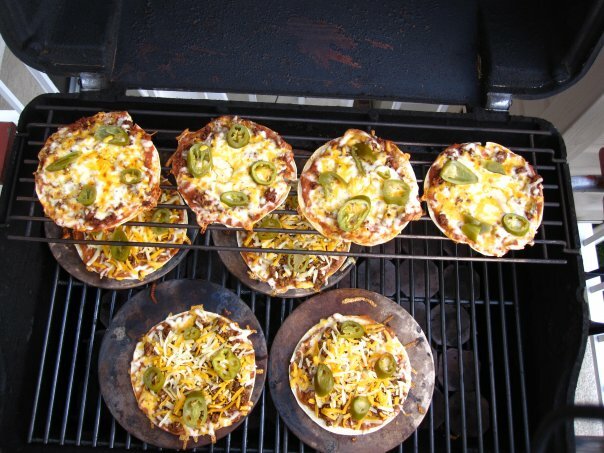 When pizza stones are hot on the grill, slid the tortillas on and close lid. Check after a few minutes to see if tortilla bottom is crisp. When the tortillas are crisp, they’re ready. Cut into quarters and serve with fire-roasted salsa, guacamole and sour cream presented on shredded lettuce. In a large skillet, heat the oil over medium-low heat. Add the beef and onion and cook, stirring occasionally, until the beef is lightly browned and the onion is translucent, about 10 minutes. Add the garlic, and cook for 30 seconds more. Add the tomato, chili powder, cumin, oregano, cayenne, chipotle chile, salt and black pepper. Stir until the spices are well distributed, turn down the heat, and simmer for 15 minutes, stirring occasionally. Stir in the masa harina until well combined, then taste and adjust the seasonings, if needed. Stir in the lime juice, and remove from the heat. To make the chips, pour 1⁄2-inch of oil into a heavy skillet and heat to 350 degrees F. If you don’t have a candy thermometer, after five minutes of heating, you can stick a wooden spoon into the oil to see if it’s ready. If the oil bubbles around the spoon, it should be hot enough. In batches, fry the tortillas for one minute, until golden brown, turning once. drain on a paper towel, and sprinkle lightly with salt. Place the chips close together, but not overlapping, on a baking sheet or large cast-iron skillet, and top each with 1 teaspoon refried beans, 2 tablespoons chipotle taco meat, and 2 tablespoons cheddar cheese. Bake for 5 minutes, or until the cheese is melted. After removing the nachos from the oven, top each with 1 tablespoon guacamole, 1 tablespoon sour cream, and 1 pickled jalapeño slice. Serve warm, with salsa on the side. Serves six. We love Stampede food traditions — the ever-present beef on a bun, mini donuts, corndogs(! 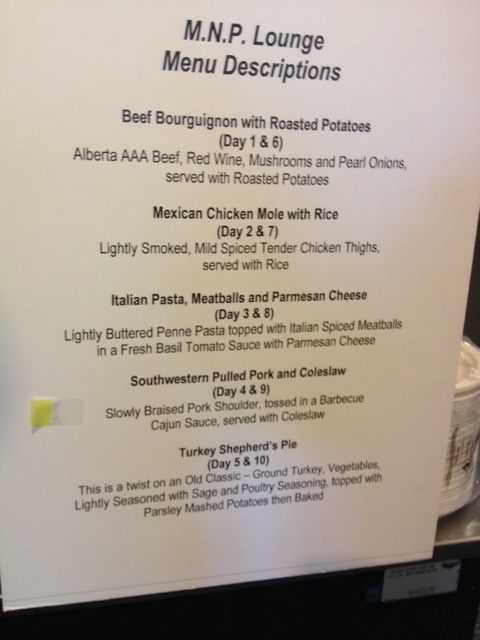 ), smokey nachos, midnight ginger beef, and flapjack breakfasts. Add this non-traditional wildcard into the mix: green curry coconut chicken. 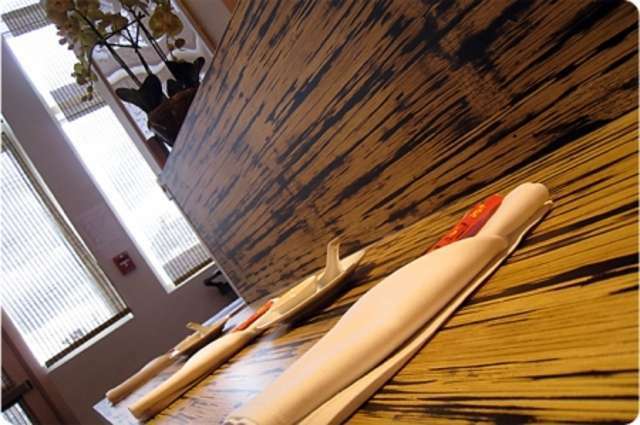 Our first date on Stampede auction day years ago was a quick lunch inside the casino at Bambu. The kicky curry laden with zucchini, mushrooms, red pepper strips and fresh basil was divine. Why not re-invent that steamy, spicy dish with a western twist? Perfect for Stampede. In a medium saucepan over medium heat, combine the chicken, coconut milk, cumin, lime zest and juice, and hot sauce. Simmer until heated through and thick (to thicken, try adding a handful of cornmeal!). Season to taste with salt and pepper. Take off heat and stir in cilantro just before serving. Fill tortillas, and top with diced onion and avocado. Serve immediately. Makes 4 servings. Stampede brings out the recipe hoarder in us. The very impetus for Saucy Cherie was sparked by a hankering to create an electronic recipe collection accessible anytime, anywhere. And Stampede party favourites were the very first recipes we posted. In the three years since then, we’ve managed to cull our tattered clipping file, surge ahead with another obsession (vintage Seventeen magazine recipes), and even helped create a Stampede centennial keepsake cookbook. Along the way, we’ve fallen out of love with delicious.com, which seemed like such a good idea before pinterest came along. Curating party recipes and planning ideas is a great way to stay organized and inspired. 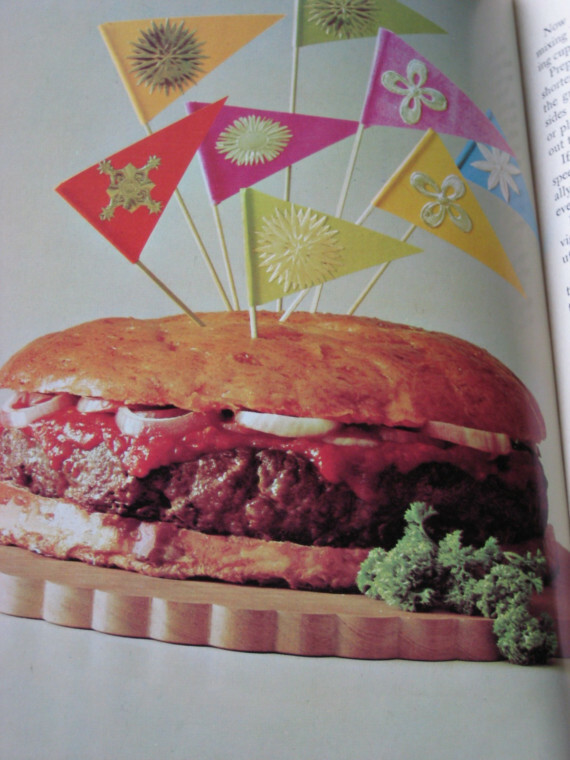 But onto this year’s Stampede recipe roundup. This chili welcomes us back to basics. 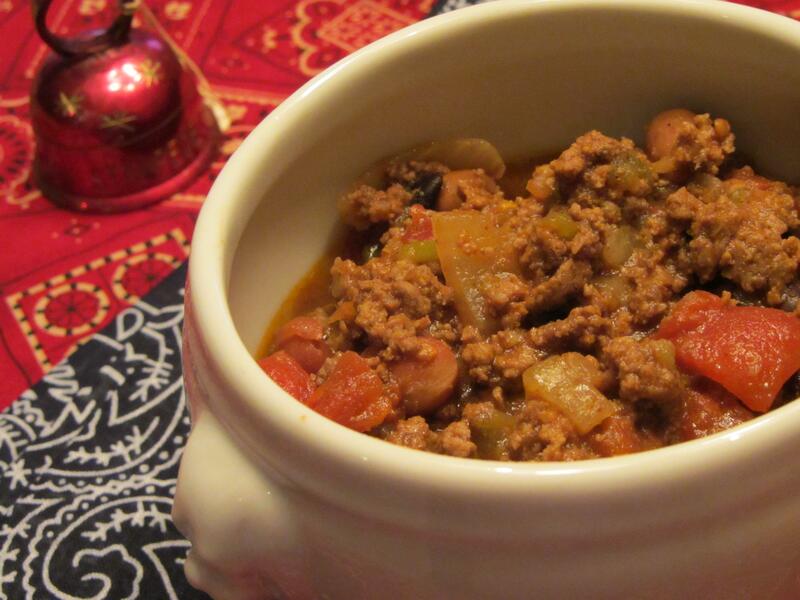 Our chili has been getting a little too out there, and this is simple and warm and good. Heat oil in a large saucepan. Add garlic and onion, and cook until onions are translucent, about 5 minutes. Add cumin and chili powder; cook, stirring, for 1 minute. Add beef, and cook until browned, about 6 to 8 minutes. Add green pepper, and cook for 2 minutes. Add tomatoes, beans and their liquid, and cook until thickened, 35 to 45 minutes. Season with salt and pepper. Serve with desired toppings.